When your wheel alignment gets a mind of it’s own, DO NOT overlook the problem or other potential issues. Letting this issue drag on can cost you hundreds, thousands or your life. Laying out a large sum of cash for a set of new tires, bushings, alignment and other potential repairs are around the corner, not to mention a potential dangerous blowout situation on the road. Watch out for . . .
Poor handling. Which could be one or more multiple systems, such as; steering system, shock absorbers/struts, tire inflation or worn suspension components. You may see a strange tire wear pattern, where the main portion of the tread is worn on the inside or outside, even towards the side wall of the tire. Also, check side walls for curb scrapes and road debris. Tires should be balanced at least once a year. Shaking or Pulling to the side. . . The car feels off-not stable, even on level ground. Most of the time these issues happen at certain speeds, with only getting worse the faster you go. Have your mechanic check the vehicle immediately. Your vehicle is potentially unsafe. Your vehicle has multiple systems that are connected to each other in some fashion. Some depend on the others to do their job. It can be a domino effect when one fails or is badly worn. IF one is bad or extremely worn and not performing well, then the others will deteriorate much faster over time, instead of the normal wear cycle. Usually the tires and the front end alignment are in the fore front of the all the systems. Tires and suspension keep everything else in check for the most part. So it is important to be aware of these items. A two minute walk around your car when pumping gas or when coming back to your vehicle in the parking lot from a trip to the mall, could be the start of saving you a huge bill or financial pain. 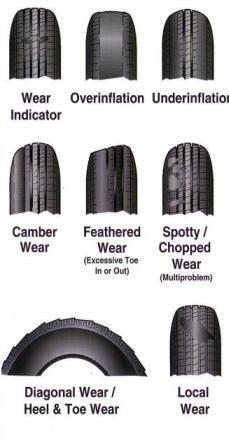 Look at your tire wear and you can gauge what is going on with some of the other systems. Big G Auto Repair has a Bear Front End Alignment System to do the necessary maintenance and service to keep your vehicle running like brand new. Thank you for considering us for your next Vehicle Maintenance Appointment! This entry was posted in American Made Vehicles, Antique Vehicles, Big G Auto Repair, Custom Vehicles, Front End Alignment, Hybrid Vehicles, Import Vehicles. Bookmark the permalink. Monday - Friday 8 am to 5 pm Saturday 8 am to Noon by Appt. Please use our contact form above.